After my explosion of dairy recommendations from yesterday, I felt very inspired to cook something non-indulgently indulgent for dinner last night. I was also in an innovative cooking mood, so it was a good night to try something new. While I was riffing a little as I went, this was sort of a play on the classic Eggplant Parmesan, only cheddar was the focal cheese instead. 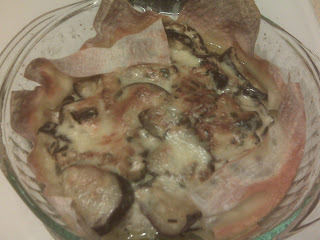 Thus, Eggplant Cheddarean! It was very easy and quite healthy! Julia said it was one of the best dishes she had ever tried. I don't know if that's true, but the key here is the flavor in the eggplant without sacrificing texture, and the creaminess of the sauce, without it being a heavy, unhealthy cream sauce. We each even went back for more! The first thing I did was chop up three small Italian eggplants into cross-sectional chunks which I then sliced in half again. This yielded about enough to fill a small, glass casserole dish. I sprinkled a generous pinch of kosher salt over the eggplant and tossed the slices gently. I then added the juice of two lemons and tossed them again and let them sit for 5 minutes. In the meantime, I finely chopped half of a red onion, 4-5 big sage leaves and 10-12 chives. I also heated up a big pan on the stovetop to around 6, or two-thirds of the way to high. While it was heating, I smashed and roughly chopped three cloves of garlic. When the pan was pretty heated, I added 2 teaspoons of extra virgin olive oil and let it warm. I added the garlic to let it sweat for about a minute in the pan alone. I then threw in the onions, chives and sage along with a little salt and a lot of pepper and let them cook down with the garlic for 3 minutes. At this point, many of the key flavors had been released and I added the eggplant that had been sitting in the salt and lemon juice. I was sure to drain all of the eggplant of the excess lemon juice, as I wanted as little excess liquid as possible to make it into the pan. I kept the casserole dish handy even after dumping the lemon juice and putting the eggplant in the pan. While the eggplant is in the pan, I wanted them to become a little crispy, so I turned up the heat a little since it was a crowded pan. I also added another tablespoon or so of extra virgin olive oil to the eggplant mixture as it cooked. I stirred them quite regularly though to keep them moving and not burning. While letting them cook, I took a couple minutes to do a few things for the latter part of the dish. 1.) Grated 3-4 ounces of 75% reduced fat sharp cheddar cheese (Cabot makes a great one). 2.) Layered about 5 egg roll wrappers in the bottom of the casserole dish, such that they overlap each other and stick up over the sides of the dish. 3.) Mixed 3/4 a cup of nonfat Greek yogurt with half of the grated cheddar and 10 drops of Tabasco sauce. When the eggplants were a little golden and crispy, I turned off the heat and scooped the Greek yogurt-Cheddar mixture on to the eggplant in the pan. I gave them a quick mix in the pan – to let the sauce pick up the remaining pan juices. After only a few seconds of mixing, I scooped the entire mixture into the wrapper-lined casserole dish. I sprinkled the remaining cheddar over the top and baked at 400 degrees for 15 minutes. When I removed it, the cheese was bubbling and the egg roll wrappers were crispy. I cooled it for a few minutes and then served. It made 4 generous servings. The eggplant and onion were unbelievably flavorful from the garlic, lemon juice, olive oil, sage, chives, salt, pepper and Tabasco, without losing too much of its texture. The pieces were tender, but not mushy and perfectly bite sized. The Yogurt sauce really bakes into the eggplant while it cooks, so there is a great coolness and tang mixed in, but it doesn't feel too heavy or too rich. The egg roll wrappers hold in a lot of the juices on the bottom and make a half-crispy, half-noodly base for the eggplant. And the pungency of the nutty, sharp cheddar throughout the dish, as well as on top, really brings out the best in all of the flavors. We both loved the dish, and it really was quite easy to make. For as little unhealthy stuff was in this indulgent-tasting dish, I'll likely be making (or requested to be making) Eggplant Cheddarean all the time from now on!